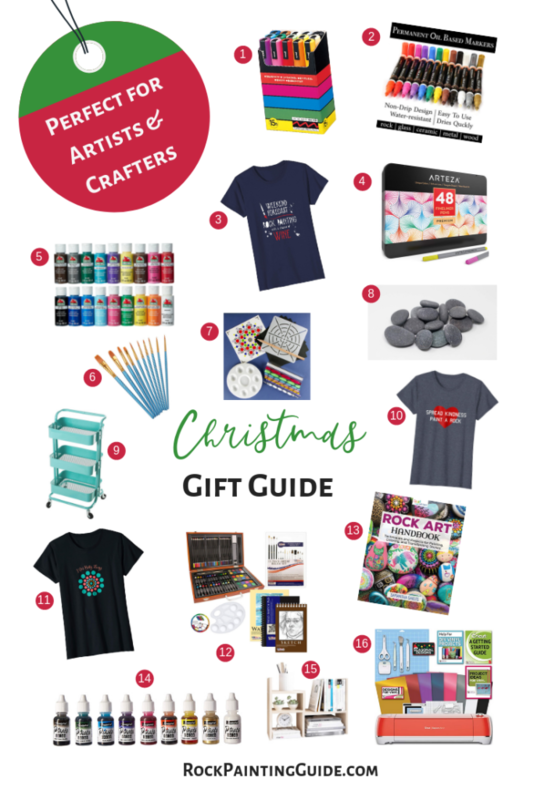 Here are my top picks for gift ideas for crafters and artists in 2018. Looking for that perfect gift for that special someone for Christmas? I’ve put together a list of my favorite things all available on Amazon for your convenience. Inside you will find up-to-date links for the perfect gift ideas for creatives, crafters, moms, and everyone in between. Perfect starter set! Uni-posca Paint Markers 15 Colors – Medium point, water-based ink, fast drying and waterproof, unlike alcohol-based marker ink, this ink does not bleed. Artistro paint pens are professional quality pens and are perfect for any craft project. Try these paint pens for rock painting, ceramic, glass, paper, fabric, and many more projects. A serious crafter is not complete without a fun and witty cute shirt to experssion their passion. Arteza fine point pens/markers. As a left-hander, I have found the perfect pen set for my doodles and craft projects. It’s smudge-free, has 48 vibrant colors, and it comes in a metal case, perfect traveling case. Apple Barrel Acrylic Paint Set – 18 fantastic paint colors that glide on smoothly, dries quickly and cleans up easily with soap and water. Heartbay Nylon Paint Brush Set is my favorite brush set for all my craft projects. This set comes in under $5 bucks and it’s why it made this Christmas Gift Guide. Mandala Dotting Tool Kit – The complete mandala toolkit: supplies include the tools, plus a paint tray, a flexible plastic stencil, black cardstock squares, a white charcoal pencil and a mandala dotting pattern. Handy storage box makes this mandala dotting tool set perfect for beginners! Who da thunk it! Buying rocks online?! If you need smooth rocks for your next craft project, try TIR Massage Stones on Amazon! Check out my Amazon unboxing video here. This stylish 3 tiered rolling metal cart by HollyHome is handy for storing craft paints, tools, and more! Spread Kindness, Paint a Rock shirt is perfect for any rock painting enthusiast. Also available in long sleeve too. This Christmas gift guide is not just a bunch of craft tools but also my favorite apparel too. I Dot Pretty Things shirt would be a great gift for any Mandala dot artist. Available in long sleeve too. I just got this for someone special this Christmas and wow, what a deal! US Art Supply Art Set is by far the perfect starter kit for young artists! Rock Art Handbook is a great addition to any mom’s craft arsenal. Filled with a lot of fun rock painting tutorials. Create something new with alcohol inks. See my tutorial on how to use alcohol inks on rocks. One of the favorite things on this Christmas gift guide, my craft paint, and tools desktop organizer. It’s stylish and adjustable. This Circut mega crafting bundle had everything you need to get started cutting and creating. I hope you find this Christmas gift guide helpful! For more helpful tips on the best rock painting supplies, visit Art Toolbox Essentials to help you start your rock painting journey today! Got little rock painters, see the Creative Holiday Gift Guide for your little Artist.